WASHINGTON — From doo wop to Motown, funk to hip hop, one constant remains. So if you like watching legends live in concert, check out Clinton and Parliament Funkadelic at the Howard Theatre in D.C. on Nov. 19 and the Tally Ho Theatre in Leesburg, Virginia on Nov. 21. A lot of folks may forget Clinton began in doo wop. Born in North Carolina, he soon moved to New Jersey where he heard Frankie Lymon & The Teenagers’ “Why Do Fools Fall in Love” (1956). So, Clinton formed the singing group The Parliaments, which won amateur hour at the Apollo Theatre in New York with a performance of “Everybody is Somebody’s Fool” by The Heartbeats. Parliament landed signature hits like “I Wanna Testify,” while Clinton also wrote “Can’t Shake it Loose” for The Supremes’ “Love Child” album and “I’ll Bet You” for the Jackson Five. As the 1960s arrived, singing groups gave way to full-fledged bands. Funkadelic really took off with the addition of bass guitarist Bootsy Collins and horn players Fred Wesley and Maceo Parker, who hailed from James Brown’s band The J.B.’s. From Parliament to Funkadelic, the hits took over the clubs one after another: “P-Funk (Who Wants to Get Funked Up? 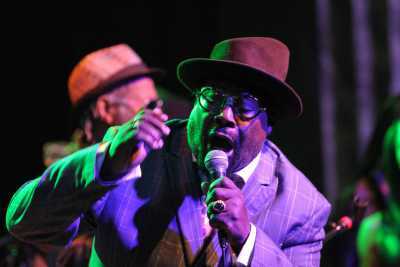 )” (1976), “Tear the Roof Off the Sucker (Give Up the Funk)” (1976), “Flashlight” (1978), “One Nation Under a Groove” (1978), “Knee Deep” (1979) and “Atomic Dog” (1982). As the 1980s rolled on, Clinton began collaborating with a number of other hot rising artists. In 1985, he produced ‘Freaky Styley,” the second album for the Red Hot Chili Peppers. Legal claims aside, Clinton’s music no doubt continues to echo down through hip-hop culture. Clinton also worked with 2Pac on “Can’t C Me” from his “All Eyez on Me” album (1996). So what is Clinton’s take on the state of funk music today? Through it all, Clinton says classic artists should embrace new music — not fear it. Clinton says there is no such thing as past or present, but that it’s all cyclical.